Join us Saturday, August 3, 2019 for a trail race on the Brighton Recreation Area trails! Leading up to the race, join us at the park for a FREE trail vendor demo & group run on Saturday, May 11th from 9a-11a. Join us at the trailhead! Trail Master 10K - Top overall men’s/women’s based on gun time and first place in each age group. Age Groups: Up to 17, 18-24, 25-29, 30-34, 35-39, 40-49, 50-59, 60 and up. Trail Fanatic 5K - Top overall men’s/women’s based on gun time and first place in each age group. Age Groups: Up to 17, 18-24, 25-29, 30-34, 35-39, 40-49, 50-59, 60 and up. Overall male and female winners in 10K, 5K and Double win a prize pack from Running Lab. 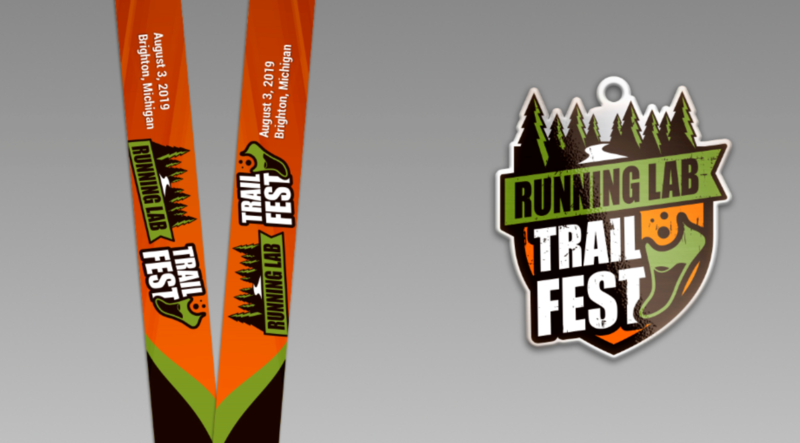 ​Each participant will receive a Trail Fest shirt and a Trail Fest medal! Friday, August 2nd at Running Lab from 10a-8p. 328 W. Main Street, Downtown Brighton. You can also pickup race day. Gate to park will open at 6:30am on race day. The course will be run from the Bishop Lake beach.